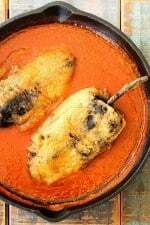 Chili Rellenos Stuffed with Mexican Queso is a Mexican classic. It is pure Mexican comfort food at its best. Stuff with a soft Mexican cheese such as Asadero or Chihuahua, or good ole Monterey Jack. The chili can be roasted and stuffed and chilled a day ahead, as well as the sauce. An instant-read thermometer helps to ensure the oil reaches 350 F perfectly...otherwise, test with a pinch of bread. Once sizzles quickly, it's ready. Enjoy! *available in most supermarkets specialty food stores, or Mexican markets. Regular oregano can be used in, too. Puree all sauce ingredients except oil with 1 1/4 teaspoons salt in a blender until smooth, then strain through a mesh sieve into a bowl, pressing on solids, then discarding them. Heat oil in a deep heavy large skillet over medium heat until it shimmers. Carefully pour in sauce and simmer gently, stirring occasionally, for about 10 minutes. (Sauce will still be thin). Taste, and season with pepper, and more salt, if desired. Set aside, but keep warm over low heat. Roast chilis on their sides over a gas flame over medium-heat, turning with tongs, until skins are blistered and slightly charred, 4 - 6 minutes. (Or, broil on a rack about 2 inches from heat). Transfer to a large bowl and cover with plastic wrap, let stand for 20 minutes. (This can be done ahead of time). Carefully rub off skins from chilies, leaving stems attached. Cut a slit lengthwise in each chile using kitchen shears or a sharp knife. Carefully cut out ribs and the seedpod. Clean out all seeds with a wet paper towel, if necessary (Leaving the seeds will make the peppers more hot). Stuff chilies with cheese and enclose filling by overlapping slit slightly, then transfer to a plate. (All this can be done the day before). Heat 1/2-inch of oil in another large heavy skillet over medium heat until it registers 350 F on thermometer. While oil heats, beat egg whites with 1/8 teaspoon salt, using an electric mixer until they just hold stiff peaks. Whisk yolks with another 1/8 teaspoon salt in a large bowl, then gently fold in whites. Generously dust chilies with flour, coating all sides. When oil is ready, dip chilies, 1 at a time into egg batter, spooning it over chile to cover completely. Fry the chilis, turning once, until golden on all sides (Lap oil over any lighter areas, 4 to 5 minutes). Transfer chilies with a slotted spoon to paper towels to drain. Ladle sauce onto plates and place a chili on top of sauce.